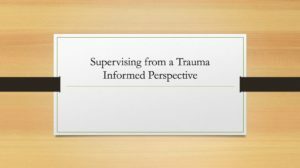 As researchers and practitioners TXICFW understands the value of creating thoughtful, comprehensive and systematic improvements to the existing base of knowledge and practice in the fields of social work and child welfare and beyond. 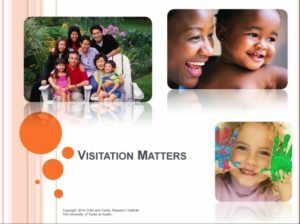 It isn’t enough to conduct and disseminate research, we are committed to applying the evidence base to create a learning environment which seeks to strengthen ideas and practices that create a safe, inclusive and trauma-informed environment for children in the welfare system, in a foster home, sexual health classroom, or in a doctor’s office to name just a few examples. TXICFW seeks to provide families and organizations with packaged curricula and interventions to help them bolster their physical, social, behavioral and mental wellbeing and promote personal and community resilience. 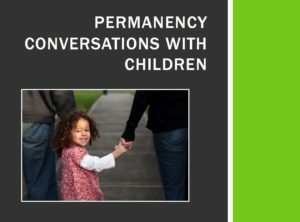 This training was developed to increase knowledge & skills that enable caseworkers to have developmentally-appropriate conversations with children about permanency, with the goal of enhancing children’s sense of well-being & safety. TXICFW developed this training in 2014 for The Texas Department of Family & Protective Services.